Every time Hanan Thibeh was faced with racism, bullied for her looks or identity, her family told her: “pick yourself up, it’s okay, this is going to happen all the time.” It is advice she internalized, but is now working to unlearn. Thibeh is a co-coordinator for the Racial Advocacy for Inclusion, Solidarity, and Equity (RAISE), a new Feds-run service at the University of Waterloo meant to create designated safe spaces and events for students of colour and their allies. RAISE, located in SLC 2141, began as a rift between some students looking for data and the Equity Office, and has now grown to be a service of its own. RAISE will have weekly Vibe Nights involving activities focused on racial identity, peer support hours from 5 p.m. to 6 p.m. every evening, and an Art Call Out later in the term. The Art Call Out will provide artists of colour from the UW community a platform to submit their art to and help personalize RAISE. They are also working to create a formal, consolidated incidence reporting mechanism. RAISE functions on three pillars which are education and advocacy, peer support, and community building. 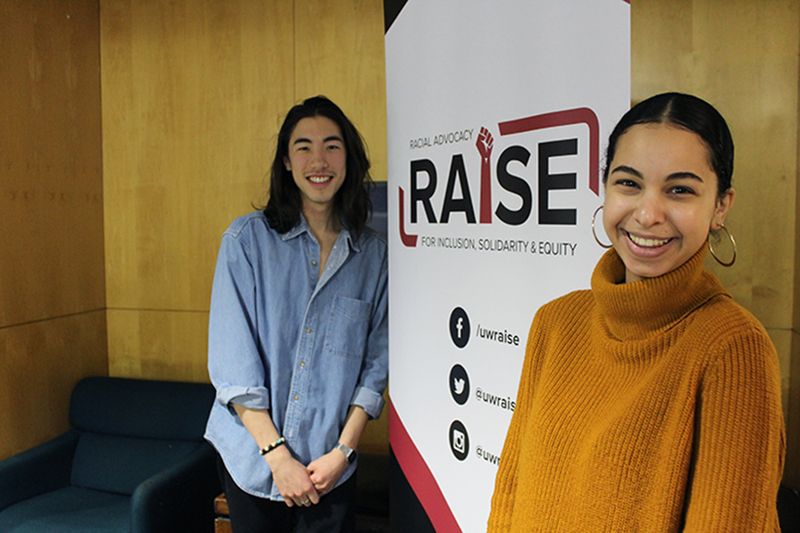 RAISE was created after students noticed a disconnect between the services provided to students and the needs of students of colour. Ethan Candler, advocacy director for RAISE, and Thibeh point to the lack of awareness in the community about the identities of some groups of people as one of the main reasons that a racialized service has not existed on the UW campus before. “A lot of people don’t really understand what intersectionality is,” Thibeh said. “We didn’t have a service because no one really acknowledged it… if you look at the history of people of colour in North America just living, our pain is kind of pushed aside.” We’re living in a white man’s world,” Candler added. For Thibeh, RAISE is meant to give a voice to those unable to speak up for themselves. “We’re here to be a voice for the voiceless in our Waterloo community and stand up for people who are… ostracized in the community,” she said. RAISE is a service based on a key aspect of identity. Thibeh believes that it will flourish for many years even after she and the other original members have graduated. “I have no doubt that RAISE, the Women’s Centre, and Glow will keep on living on… because these are people’s identities, and you can’t ignore your identity,” she said. Candler and Thibeh are also excited for the activism and passion in today’s high school students. They believe that this passion will keep RAISE alive. “Youth apathy in politics, universities, education… was such a detriment to their experiences,” Candler said. RAISE has its official launch on Feb. 27, and a conference planned for Mar. 23. For more information or to volunteer, contact uwraise@gmail.com.